My neighbor Sara tried another gluten free recipe that was so delicious! It has been so nice for me to have someone close by to experiment with. I love running food over there… or hearing her knock at the door as she hands me a plate of food. 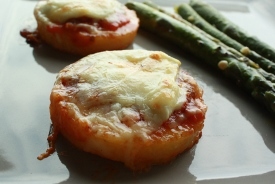 We thought this would be good as an appetizer or serve it for dinner with a great salad. Cut the polenta into 1/2 inch thick slices and place them on the baking sheet. Spread a tablespoon of sauce on each polenta slice. Then place a tablespoon of ricotta on each slice. Sprinkle the top with some shredded cheese. Place under the broiler for about 5 minutes or until cheese is golden brown.